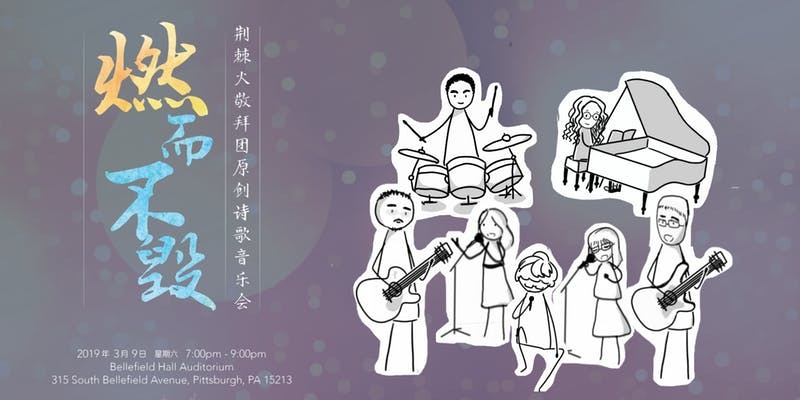 The Chinese Bible Study Fellowship and the Pittsburgh Chinese Church of Oakland will host a musical performance by Burning Bush on March 9. Please note: the entire event will be in Mandarin. Join the Chinese Bible Study Fellowship for a night of music sharing by Burning Bush Worship Band from Chicago that creates all original content. It's a time to relax, enjoy music, and meet some new people! Free refreshments will be provided. Please note that the entire event will be in Mandarin Chinese. We hope to see you there! Tickets are free, please sign up with the link below. The event is free but registration is required and can be made online. It runs from 7:00 to 9:00 pm in Bellefield Hall in Oakland (map).